More important than the Music Builds contest is helping to build homes for deserving individuals through Habitat for Humanity! TODAY IS THE LAST DAY TO DONATE AND HELP THIRD DAY, SWITCHFOOT, AND THE OTHER BANDS OF THE MUSIC BUILDS TOUR BUILD HOMES!!! Third Day has 122,704 MySpace friends, Switchfoot has 331,803, Jars of Clay has 89,139 and Robert Randolph and the Family Band has 51,497. And sure some of those friends are on more than one of these band's MySpace friends lists, but it's very hard for me to believe that with that many friends the Music Builds Habitat for Humanity fund raising effort has only raised $2500! That's terrible! Just think if every one of Third Day's 122,704 MySpace friends gave just $5! That would be $613,520.00 raised to help build homes here in the USA!!! Even if each of Third Day's MySpace friends gave just $1, that would be $122,704.00!!! That's so much better than the little $2,500 that has been raised. So I'm asking you, each and every one of the 1064 Third Day Gomers MySpace friends, to reach into your hearts and your pockets and give something to this most worthy cause. Let's show that the Third Day Gomers are more than just a fan club, that we stand by Third Day and support them in the causes they stand with, that we want to further the Gospel of Jesus Christ by spreading His love and care for others in this way. But we must hurry! THIS FUND RAISING EFFORT ENDS TODAY!!! To give, simply click below. If you'd like to help someone win the contest, click on their name and go to their MySpace widget to give. But PLEASE GIVE! All the money raised goes directly to Habitat for Humanity. Gomers - Let's Raise $ for Habitat! So you've read about the contest where you can win a spot to build a house with Habitat for Humanity and work with the guys from Third Day, Switchfoot, Robert Randolph and the Family Band, and Jars of Clay, but you aren't really into that. You'd love to hang out with those guys and work with them, and you love the idea of spending the day doing something for someone else, and sitting in great seats that you didn't pay for at the Music Builds show that night with $1,000 in your pocket to pay for travel and lodgings sounds exciting, and sure, you'll take the band merch and the free copy of Revelation, but you just don't want to enter the contest. I understand. But you can still be involved. You can help the Music Builds Tour bands raise money to help build houses across the United States by giving to Habitat for Humanity. All you have to do is to find one of those that have entered the contest by putting the widget onto their MySpace, and donate. By doing so, you will help deserving people build a home they can be proud of, and give them a brand new start in life! You will also help one of those participating in the contest win! Just look at the widget below or here. Click "Fundraisers" and find someone you'd like to help win. Click their picture, which takes you to their MySpace, and donate using the Widget on their site. You may donate using this widget or the one on the Gomers MySpace. That won't help anyone win the contest, but it will help a family get a new home! I'd like to see the Gomers really step up and help Third Day raise a lot of money for Habitat for Humanity! This is our chance to show we are more than just fans of Third Day, that we also walk along side them in their endeavor to make this a better world, and to bring people the love of Christ by caring for them in their time of need. So what do you say? Give a few dollars for the cause! I thank you, the Gomer family thanks you, Third Day thanks you, and mostly the family that will live in the homes built with the money raised thanks you! May 20, 2006, Atlanta, GA, Christmas Offerings recording session – Haven't you always wanted to sit in on a recording session? I have. I've always wanted to watch my favorite bands actually creating the work of art that will be their next CD. When Third Day's management told me that Third Day wanted to make the recording of Christmas Offerings an event for 150 of their family, friends, and fans, I was thrilled! It was my job to round up about 50 Gomers who would be in the Atlanta area that day and would like to go to the event. As you might expect, this was not a difficult job at all. Nickel and Dime Studios is a cool old place, decorated with orange and other colors I love, and retro furnishings. I thought the décor was beautiful. You can see the inside and outside of the studio in the Cry Out to Jesus video, as they filmed the whole video there. For the recording session, the studio was decorated with lights and Christmas trees. It put us into the proper mood, even if it was the middle of May and 80-something degrees outside. The recording itself was pretty cool, but a lot more tedious than I'd imagined. I guess I never thought about it before, but it makes a lot of sense. You are recording about 12 songs, and trying to get the very best sound for each one. So I imagine you do work them over and over again, making changes and listening to suggestions from each other along the way. Then once you get them how you want them to sound, you probably have to play it again and again to get just the right version recorded, adding nuances here and there. It's a lot of work! The guys had pretty much all of that done by the time we got there, but we did have to sing stuff over and over again. It gave us just a little taste of what they must go through to make a record. After this, I had a whole new respect for the band, for any band who records a really good CD. Our recording session was amazing, because we not only got to see how they make a record; we got to be on the record! Traditionally, the Third Day Offerings records are part songs recorded in a studio and part songs recorded live. This one was no different, except the live part was recorded with the audience as the choir on the record. They gave us lyric sheets, and Mac directed us on what to sing, how, and when. We didn't get to hear the whole songs, just the parts we sang. They also told us about some of the other songs on the album, and let us hear a little bit of them, just a tease really. But it was enough to get us even more excited about the Christmas Offerings CD! After the recording session, everyone visited with each other and the band for a long while. One of my favorite parts was when Debbie, Bari, Traci and I were standing away from the remaining folks, next to one of the Christmas trees. Mac was over there, too, putting a guitar away. One of us had a camera in our hand, and we said, "Um, Mac? Could you do us a favor?" He came over to where we were standing, ready to take a photo. However, we didn't exactly want to take a photo with him. For a change, we wanted him to take the photo of us. So this is my favorite photo from that night. Not only is it four friends at an amazing maybe once-in-a-lifetime event, but one of our favorite rock stars took the photo. The story doesn't end there. The following April, Third Day won a GMA Dove Award for Christmas Offerings! To celebrate that, and thank each of the "choir" members for their part in making the CD, Third Day sent a 5x7 inch postcard (which is almost the actual size of the Dove Award itself!) with a photo of their Dove on one side, and a note from Third Day on the back. What a thoughtful thing to do! I framed mine. So cool to have a "Dove" of your very own for a record on which you actually sang! This is also the only Third Day show I've ever been to in Atlanta, Third Day's hometown. That made it even more special for me. It occurs to me that some of these stories may sound like I am bragging. I don’t mean to sound that way. I’ve kept most of this to myself until now, but I thought it would be fun to share it with you. I hope you are enjoying reading my adventures. We are into the top ten now! 10.) October 21, 2006, Houston, TX, WYA Tour, GuluWalk, and Gomer pre-show dinner – Months before the Wherever You Are Tour, I had been praying for some way the Gomers could participate in some kind of service project. God dropped the perfect event right into my lap. Rushia Wallace, then of the Houston chapter of the worldwide GuluWalk, emailed to see if there was some way Third Day could help out with the Walk in Houston. This was the perfect event for the Gomers! Not only did it involve a cause that was near to Third Day’s hearts, the event took place the weekend of the Third Day concert in Houston! And the official GuluWalk color the same shade of orange that the Gomers wear! This couldn’t have been any more perfect. So I worked it out with Rushia for the Gomers to participate. We got donations from friends, family, and other Gomers. The Third Day Gomers team came in third across the country, raising $2,245.00. Sixty Gomers walked in Houston, and four in other cities. All five Third Day guys, Scotty, Nigel, Third Day’s business manager Lillian, and Ray from Hyper Static Union walked with us. We had a beautiful day in the park with Third Day and raised money and awareness for a cause we believe in. You can read more in the original blog posts here and see the photo album here. This was a very well documented occasion. In addition to the original blog posts and all the photos, I also have never-before-seen video. The first video is Tai’s speech before the GuluWalk (9:18 long. For best results, let it load before you try to watch it). The second one is a clip of everyone walking. I know that Tai said we should walk solemnly, but you will hear a lot of laughing because we were having so much fun. Be sure to study the photo of the Third Day guys at the very beginning of the clip, so you will know what they are wearing. That way, you can find them walking in the video. Listen for David talking in the beginning. After the GuluWalk, we had dinner at Pappas’ BBQ in downtown Houston. They have great BBQ and Texas-sized baked potatoes. We filled the large room they had reserved for us. We had drawings for about 10 prizes, all kinds of things like CDs, books, a couple of cozy orange throws that say “RockStar” on them, and some autographed items. We had a great time visiting with each other. Take a look at the photo album from the dinner. Then it was on to the show. The Toyota Center, which is a huge place, was packed to the rafters. There were patches of Gomers in orange all around. The audience was super-charged and ready to rock! And Third Day did not disappoint. They tore the place down. It was awesome. I got some amazing photos, despite sitting behind Tugboat, whom I love, but who is 6+ feet tall. Take a look at them. In this post on the Third Day blog, Mark talks about his top ten Third Day shows. He lists the 2004 Great Gomer Gathering in Houston, Texas, as his third favorite show. I started to put my comment there, but it started to get a little lengthy, so I decided this would be a better place. That "sea of orange" in the audience was quite a sight! I'll never, ever forget it. I sent KSBJ email after email telling them that this was going to be the first Great Gomer Gathering, and could they help us surprise Third Day with a "sea of orange" by having everyone, all 14,000+ audience members, wear orange. How awesome that would be!!! Third Day would take the stage and be totally amazed at the love and support from the audience. It had been my fantasy for years (still is) that there would be tons of people at every show wearing Gomer shirts. This idea was just an exaggeration of that fantasy. I had no idea it could be as awesome as it was! At the concert, Dan and I walked all around the Pavilion, up on the grass hill, just looking at 12,000 or so people dressed in orange (there were about 2,000 hold outs). This may sound silly, but I cried. It was so beautiful! There was so much love poured out to this band I loved, our chance to give back a little of the love Third Day had given to us for so many years. Later, Third Day's manager told me that when Tai exited the stage he told her, "It don't get no better than this." Mission accomplished! Of course, now I have the problem of trying to figure out what the Gomers can do to top that! Any ideas? Salvation Mountain is a real place. Located north of Calipatria, California, it has been entered to the congressional record as a national treasure. Leonard Knight created Salvation Mountain as a large public art project designed to send the message that "God Loves Everyone." Third Day drew inspiration from Salvation Mountain to create the album cover for their new album, Revelation. The cover is an artistic interpretation of Knight's creation composed of the song titles of the album to send our own message of God's love to the world. Using Third Day's music as your inspiration, create your own piece of art, your own revelation. It can be anything from a short story inspired by a song, a music video, a short film, a painting, or a cartoon. Anything! We'll post your art on the Revelation page of the new Third Day website to share with the larger Third Day community. Send your submissions to tdrevelations@gmail.com to be considered for placement on the website. All video or audio samples must be uploaded to YouTube and link sent. Please: Do not send raw audio or video content. We'd like to have some entries before the website goes up on April 23, which means we need them soon! Be the first to get your work displayed on the website! I've been thinking about a Christmas project we can do this year. I'd like us to send holiday greetings to soldiers overseas. There are many ways you can do this, and since we all have different lifestyles and different demands on our time, I've given you several alternatives. Choose which suites you best. The first website www.AMillionThanks.com is something Brad Avery in involved in, as he co-wrote the song, "Thank You," for the project. (You can buy the song on the website.) They prefer cards that you make yourself, but you can send other cards and letters as well. The instructions are here. If you'd like to write an email to a soldier, to go www.AmericaSupportsYou.mil and use this form to type out an email. Xerox has a really nice idea. They have postcards drawn by kids, and you just fill out your sentiments. They print out the postcards and send them to the troops. They have several already written out for you, or you can click "other" and put in your own thoughts. The website is Let's Say Thanks. 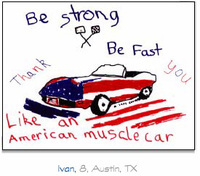 I particularly like this card, drawn by eight year old Ivan from Austin, Texas. So there you have it. Find the way that works best for you and send the troops some Christmas cheer! So have you ever wondered how much exercise you can get dancing at a concert? Well, I have, and I found out. But first a little back story. Three months ago, I decided to get serious and lose some weight and get into shape. Towards that end, I started wearing a pedometer everyday. The idea is to walk about 10,000 steps per day. The average person walks this much, and it's equal to about five miles, depending on your stride. So I wore it to a couple of concerts. I went to see Family Force 5 one night and TobyMac another night. At the TobyMac show, I danced 6,000 steps!!! Now that was a rockin' show! At the FF5 show, I danced 4,000 steps. That show super rocked, but I think my pedometer was hampered by the fact that I was standing on a couch the whole time. Much easier way to see, but not as easy to move. Now you may think that that wasn't really walking steps so it doesn't count, but movement is the goal, and I can tell you I was moving! Anyway, all this to tell you that if you are interested in losing weight, there are a group of Gomers that are encouraging each other in that goal. If you are moving toward that same goal, please come join us. I've lost 18 pounds so far, and it's kinda fun! Come read my weight loss blog to see how I'm doing it! You can also see what five pounds of fat looks like there. Yuck! Nominate Third Day to the Georgia Hall of Fame! We need your help! Time is running out to get Third Day nominated for the 2008 Georgia Hall of Fame. All nominations should be postmarked no later than December 1, 2007. Read the details below, and let's get busy. We got work to do . . . The Glory Revealed book releases today! Following the successful release of the worship album, Glory Revealed – David Nasser releases his book, Glory Revealed: How the Invisible God Makes Himself Known, nationally this week. The God of the universe has gone to great lengths to make himself known to us. We might not physically see his face or hear his voice, but we can always be assured that He is present. God is not hiding; he is actively revealing Himself to us. Nasser’s new book, Glory Revealed: How the Invisible God Makes Himself Known is about learning to see and hear God in our everyday lives. God is not silent; we just have to learn how to listen. He is not absent; we just have to know where to look. Join author and speaker, David Nasser on a journey to find the glory of God revealed in YOUR life.